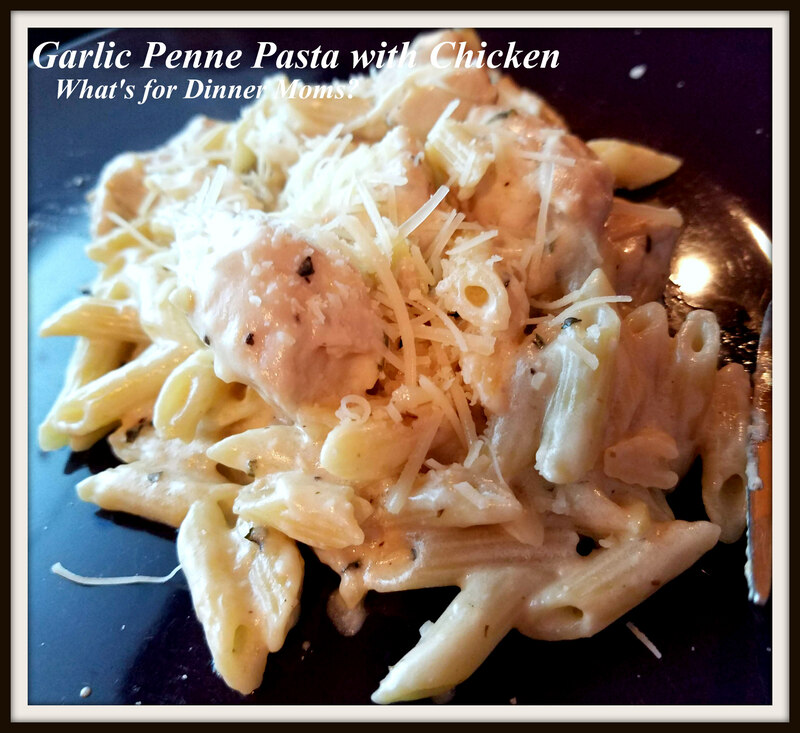 Creamy Garlic Penne Pasta – What's for Dinner Moms? Last week our grocery store had the frozen meals of pasta and chicken in sauce for $6. You heated the mixture up in a skillet for about 15 minutes and had dinner on the table in about 20 minutes. They were called “family sized” but they were about 2 1/2 servings for my family. We bought two of them that we supplemented with a vegetable and a side salad. As we were making them for a quick evening meal I thought I could do better than this as far as taste, price, and amount of chicken in the meal. Well, everyone thought this was better than the frozen meal! Yeah! As far as ease of making it I did take a bit longer and had to use 2 pans to cook it, one for the chicken and sauce and one for the pasta. But, overall it was really no harder than the frozen meal. My daughter said the hardest part seemed to be chopping the garlic and I think she was right. We had enough leftovers for three small lunch portions which everyone was happy with. I love leftovers for them for lunch. Makes our days easier. A simple meal that tastes like it came from a restaurant. In a large, deep skillet, heat olive oil. Add chicken and season with salt and pepper. Cook until chicken is no longer pink, about 5 minutes. Transfer to a plate and set aside with the pasta. While chicken is cooking put a large pot of water on to boil. As you start the sauce you can start cooking the pasta according to package directions. Drain pasta well when done cooking. Add 3 tablespoons of butter to the skillet you cooked the chicken in and melt. Stir in garlic and cook for about 1 minute. Stir in flour and Italian seasonings cook for about 1 minute or until golden brown. Stir in milk and chicken stock and simmer for several minutes until thickened. Remove from heat and stir in half of the Parmesan cheese until melted. Toss the cooked pasta and chicken with the sauce to coat, then stir in remaining Parmesan cheese and top with parsley, if desired. Taste and adjust spices as necessary. This sounds very good! I love pasta, chicken, and garlic! Can never go wrong with those! You just got followed, and I share recipes a lot with this blog because this is for a delivery company and I like to share all things food. Hope you don’t mind if I share an occasional recipe with the communities we serve. If so, no problem!